Congratulations to the 2010 World Series Champion San Francisco Giants! It was a long time coming after 53 years out on the West coast and 57 years since the last title in New York. Of course “long time coming” and 57 years is all relative to your own point of view…enough said. Today is election day, so remember to get out and vote! 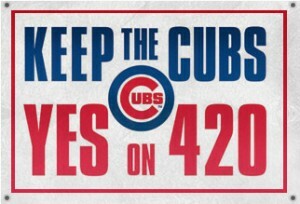 If you live here in Mesa, AZ please vote YES on proposition 420 to keep the Cubs spring training here. Hopefully you’ve already done some research on the issue and understand it’s a winning proposition for the City of Mesa, Arizona’s Cactus League and the state of Arizona. It’s also interesting to note that both the World Series winning Giants and the runner-up Texas Rangers started out last February/March here in Arizona’s Cactus League. So another baseball season is in the books and the clock is now ticking until pitchers and catchers report. As always we will have the best Cubs coverage here at BOS once they arrive for spring training, including exclusive content you won’t find anywhere else. Now get out and vote!